In the year 1205, Sir Philip of Vercy returns home to France after a grueling year as a knight fighting in the Holy Land only to learn that his beloved wife is dead in childbirth and his newborn son is frail and sickly, on the verge of death. Consumed by grief, he travels to Languedoc in search of a miraculous healer named Fabricia Berenger, a nun, to save his son’s life. But once in Languedoc, he finds himself thrust into the dangers of battle against the Papal military who are waging war to eliminate the Cathar heretics. Fabricia Bérenger receives visions from the Virgin Mary. Her devotion to her faith is strong and along with her prophetic visions, she receives the Stigmata, open wounds to her hands and feet that bleed like Christ’s wounds did on the cross. Philip is plagued by his conscience and his future. Nothing is the same, death of his wife, and all the killing in battle deeply affecting him. Fabricia’s presence in his life affects him deeply as he is more and more drawn to love her. 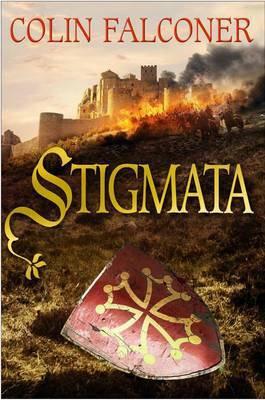 Stigmata by international bestselling author, Colin Falconer, is an intricate story with rich characters and an intense plot that proved to be an enthralling read. A touch of Catholic mystery, a broken hero who is trying to rebuild his shattered life, and a heroine blessed/cursed with the ability to heal that keeps her in constant turmoil. It was a turbulent time of heresy, crusades, and the struggles to overcome devastation. Beautifully written in typical Falconer style with plenty of snap and sharpness, and wonderfully researched, I enjoyed every page of this book. Fast paced, sprinkled with unique and unusual details, and with plenty of emotion, makes this a must read for those who love the medieval period or books about the unexplained mysteries of life. Loved, loved, loved this novel. Rivting!